Stand or sit with a bar, pole, or stick behind your neck and across your shoulders/trapezius, holding the apparatus securely in place with your hands. If standing, your feet should be far enough apart to balance, and ideally not much wider than shoulder-width. Rotate your torso (upper body and shoulders) from one side to the other side (left, right, left, right, etc. 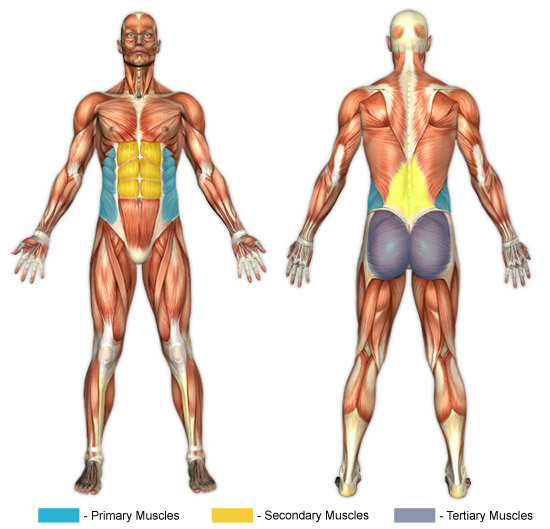 ), squeezing your obliques and abdominals as your reach the end of each rotation. You may briefly hold at the terminal aspect of each repetition. Fix your eyes forward and keep your pelvis stationary by isometrically contracting your gluteal muscles. See "Further Clarification" for elaboration of the concept of isometric contraction. Repeat the side to side rotation for several minutes, if possible. Most people find breathing on each rotation unnatural. This is why no prescribed breathing method is laid out. Nevertheless, make sure to breathe. Performing twists from a seated position can aid in maintaining the preferred fixed pelvis position, which results in better oblique and abdominal muscle recruitment. This is not to say that it is not possible to maintain a fixed pelvis when doing twists standing, only that it may be easier from a seated position. Isometric contraction of muscles is performed in a static (non-moving) position, as opposed to moving through a range of motion. In other words, when contracting your muscle(s) isometrically, both the muscle length and the joint angle will remain unchanged (i.e. are actively held in a fixed position) throughout the contraction of the muscle. Generally this exercise is done with low resistance/weight for a high amount of repetitions. However, you may use a weighted bar if you would like more of a challenge, but if you do so be especially sure to observe proper form. Do not swing or jerk from side-to-side. Deliberate and controlled movements are much safer, and will yield better results. This exercise is contraindicated for individuals with current low back problems and previous low back injuries (such as disc herniations, slipped discs (i.e. spondylolisthesis), etc.). Choose a low back exercise that does not involve rotating if you are among these individuals.